NOBODY interferes with my food. The Canine Court judges you innocent. Go to Scottie Mom and get some "make-up" treats. Oh My! Such a story..Scotty Mom could have saved your life! What if a bad person had put poison or a razor or or…Oh My! in the meat!? Did you think of that Mr. K? Tend to agree with Fozzie mum. Both “people” were “right”. Maybe teach K to “drop it” if a next time, but probably won’t be and since Scotties like the approval of their masters, next time he’ll probably let it go. Both people were "right", Mr. K and Scottie Mom. 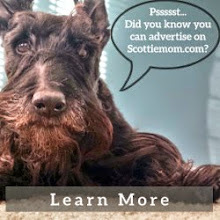 Scotties don't like to make their masters angry. Next time I bet he gives it up. Might teach him the words"drop it"? Unfortunately, these things happen. Not often, but sometimes, even in a loving dog. Maybe teach Mr. K to learn what "drop it" means? He does look a bit guilty. You were right to try to get the meat away. I'm sure he's a great dog, maybe this is no great earth shaking issue. 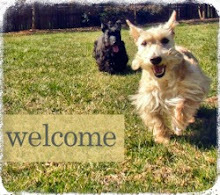 Scotties don't like to hurt their masters. I bet next time with a little coaxing, he'll give it up. We understand your dilemma Mr. K....but we do think your Mama was only trying to do what was good for you. Our Mama taught us "drop it" and we know that when she says that, it is for our own good. We think that if you just give your Mama lots of snuggles, that would let her know things are good between you both. We all know Mama's rock when it comes to unconditional love!! Oh Mr K this is a tough one! We're not gonna take sides or judge, we're just going to advise that you do your best to let your mom know that you are sorry. Mr. K your mom knows whats best for you. Show the love to your mom and say you are sorry. I know you get lots of good eats from her so you did not need to keep that dirty dangerous treat. Ugh it's always a nightmare situation when a dog finds something they really shouldn't eat, such as a bone. I know with Kasper and Zoey they wouldn't obey a "drop it" for a bone no matter how high value treats I had, but if I tried to take it from their mouth Kasper would most certainly react. Tough situation. I'm glad you were able to get the bone from Mr K and didn't get too hurt! Sorry Mr. K but I side with Scottie Mom on this one. If I were you I would kiss her finger and say you are sorry. Mr. K, your mom was just protecting you from any harm. Give mom a smooch and all will be forgiven. You are loved too much for mom to be mad. Kim, Magnum and Ruby. Oh dear things do get lost in translation. You tasted something good and poor mum thought it might be something bad. We think you go give mum a few kisses and all will be forgiven. We speak dog and they speak human so stuff happens. Have a marvellous Monday. Your owner reaches in one end and your vet reaches in the other end. Why oh why are they always trying to get out what is inside of you. Ownership says What's Mine is Mine, and What's Yours Is Mine! Well, Mr.K, we are on your side, remember the Scottie Laws, you find it, It's yours, yep we heard them stories about not good, but we know they just wanted it. Well now then, the biting Moms finger was not good, you gots a lot of kissing up to do! Speaking from experience, it's better to drop it than have fingers in my mouth. I secretly applaud you for being so quick! Aye, laddie the verdict is in an ye' no in the rrrright. 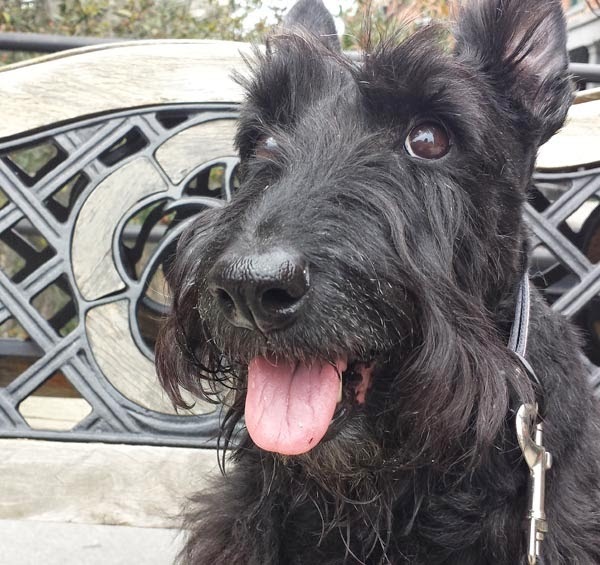 I am an old Scottie of 16 an' I ha lots of yearrrrs of learnin'. I kno ye feel slighted lad, but yer ma did the rrrrright thing! There be lots of bad bones out therrrre an' bad folks meanin' ta do harm ta dugs...always listen ta yer ma laddie. Even though we have been taught drop it and leave it, we have tried to grab the odd road snack from time to time. SHE jerks us up by our hind quarters, tucks them under her left arm so our head is swinging upside down...if we aren't so startled that we immediately drop our tasty treasure, she sticks her right hand in the jaw joint and flicks the contents down to the ground. She is lightning fast! We are so startled by the whole operation our mouths generally fly open in astonishment and we loose our yummy. People observing her, bent over at the waist, squirming Scottie held clamped upside down under one arm, have been known to rush to our aid thinking she is having some kinf of fit. She calmly restores whichever of us is wrong side up to the ground and continues on as if nothing happened. She says she prefers to start at the rear end as there is less chance of encountering a sharp tooth in step one.